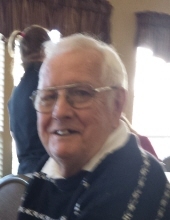 ROCKVILLE- Russell E. Mendenhall, 80, of Rockville, Indiana passed away Sunday December 2, 2018 at Clinton Gardens in Clinton, Indiana. He was born February 12, 1938 in Early, Iowa to the late Dwight Mendenhall and Gertrude Niceswanger Mendenhall. His wife of 59 years, Phyllis Kirkham Mendenhall whom he married May 18, 1958 preceded him in death March 1, 2018. Russell grew up in Early, Iowa and graduated from Early High School. Upon graduation he enlisted with the United States Air Force where he had a 21 year career across the United States and around the world. After his Air Force career he was employed by Eli Lilly Clinton Laboratory until his retirement. Survivors include his five sons, Randall (Julie) Mendenhall of Huger, South Carolina, Rodney Mendenhall of Clinton, Robert (Diana) Mendenhall of Dana, Todd (Lorrie) Mendenhall of Monroe City and Tim (fiancé Wendy) Mendenhall of Lafayette; one sister, Rosella; one brother, Ralph; 13 grandchildren, Dustin, Drew, Kari, Stacey, Steph, Doug, Jamie, Ryan, Michael, Matthew, Rebecca, Rachael and Chase; 13 great-grandchildren. He was preceded in death by his parents, infant son, Roger Douglas Mendenhall, sisters, Virginia and Wilma and brother, Richard. Services will be 1:00 pm Wednesday, December 5, at Gooch Funeral Home, 112 W Howard Street, Rockville, with the Rev. Mark Houvenagle officiating. Burial with military graveside honors by Parke County veterans will follow at Memory Garden Cemetery, Rockville. Visitation is from 11:00 am until 1:00 pm Wednesday at Gooch Funeral Home. To send flowers or a remembrance gift to the family of Russell E Mendenhall, please visit our Tribute Store. "Email Address" would like to share the life celebration of Russell E Mendenhall. Click on the "link" to go to share a favorite memory or leave a condolence message for the family.